expressed Mian Syed Zaman, a 55-year-old father of seven children from Serei Kana village of Shangla district in Khyber Pakhtunkhwa (KP) province of Pakistan. Although Syed Zaman’s income was not much, he lived a content life with his wife and children. In 1998, that changed. Zaman started feeling sharp aches in his lower back. The pains kept worsening until one day Zaman felt nothing in his lower body. He was paralyzed from waist down. He tried everything to cure himself, whatever he could afford, wherever he had to travel for it. But it was all in vain. Zaman had become bed-ridden for life. Following his father’s early footsteps, Zaman’s eldest son, Zia-ur-Rehman, had to leave school, graduating from Grade 8th, to start work to support his six siblings and mother. He had no choice but to do so. Married and with two children of his own today, Zia-ur-Rehman is the sole bread earner for a large family of twelve members now. He works in the same coal mine his father used to work at as a daily wager. He earns PKR 25,000 (Approx. 215 USD) a month. With this income, it is difficult to make ends meet and provide sufficiently all family members. Neighbours and relatives of Zaman and his wife often gift money and used clothes to the struggling family. Zaman’s family also receives Zakatⁱ, in the form of money, once each year from the Government Zakat Department under the quota for disabled people. The family owns a cow, three goats, some poultry and a small piece of land adjacent to their home. Zaman uses the land to grow animal fodder, some vegetables and maize which helps the family sustain their meals for about five months. Zaman’s house is a scantily constructed mud house where they all live together. During a survey conducted by Community World service Asia (CWSA) in early 2016 to identify and select most vulnerable earthquake affected families, Zaman and his family were selected as participants to receive support in rebuilding their house and in construction of latrines. 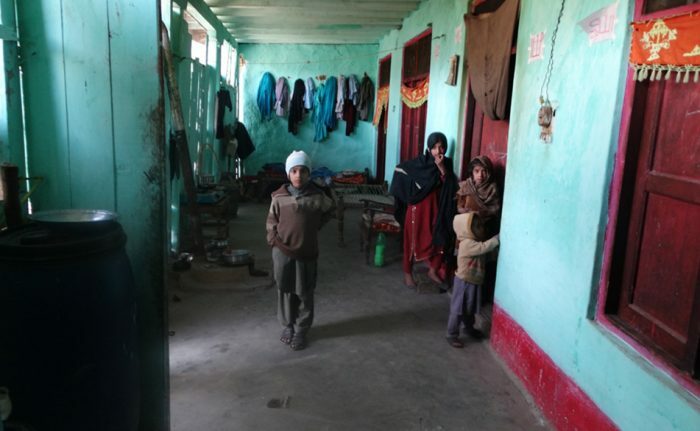 Zaman was selected on the basis of being a Person with Disability (PWD) and because his house had been severely damaged in the 2015 earthquake that epicentered in the Hindukush mountain range. Zaman received Corrugated Galvanized Iron (CGI) sheets which were sourced by the Earthquake Reconstruction and Rehabilitation Authority (ERRA). They were also provided with raw materials to reconstruct their house by CWSA. Zaman’s house was completely reconstructed in 2016. 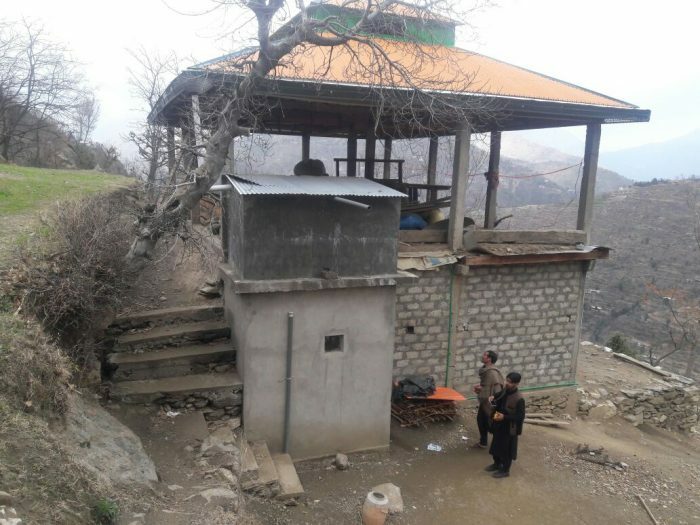 CGI sheets were used to construct the roof to ensure the family’s safety during future hazards in mountainous and risk prone areas like Shangla. Most importantly, in early 2017, a complete latrine with two commodes was constructed and included in Zaman’s new house by his son himself. Our family is living comfortably now. They do not need to go to the jungle for open defecation anymore. There are no flies and smell of excretion around our home anymore and the surrounding environment looks and feels much cleaner and fresher now. I have installed four small wheels in my cart to easily reach the latrine with the help of a stick. It would be great if I can be provided clutches and wheelchair. In addition to latrine and shelter construction, Zaman’s family was provided with hygiene kits, which included two plastic cans with lids, one water pot (lota), soaps and sanitation cloths. The cans helped the family to carry and store drinking water in safely, minimizing the risks of water contamination. ⁱZakat is a religious obligation for all Muslims who meet the necessary criteria of wealth. It is a mandatory charitable contribution, the right of the poor to find relief from the rich and is considered to be a tax, or obligatory alms. 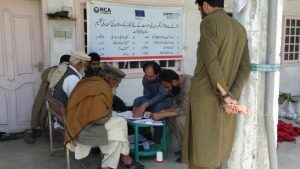 Integrated Emergency Shelter and WASH support to EQ affected families project is implemented by Community World Service Asia in district Shangla, Pakistan with the support of European Civil Protection and Humanitarian Aid Operations (ECHO) and Norwegian Church Aid (NCA). 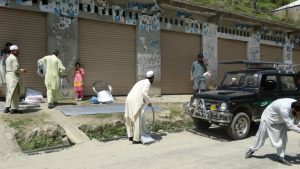 Community World Service Asia is implementing an integrated emergency WASH and Shelter project for families affected by the 2015 earthquake in District Shangla, Pakistan. The target Union Councils of the intervention included Shah Pur, Damorhi, Kuz Kana, Bar Puran and Banglai. The key components of this short-term disaster response project include Rehabilitation of Water Supply Schemes, Repair and reconstruction of Latrines and Distribution of Self help repair Shelter kits. 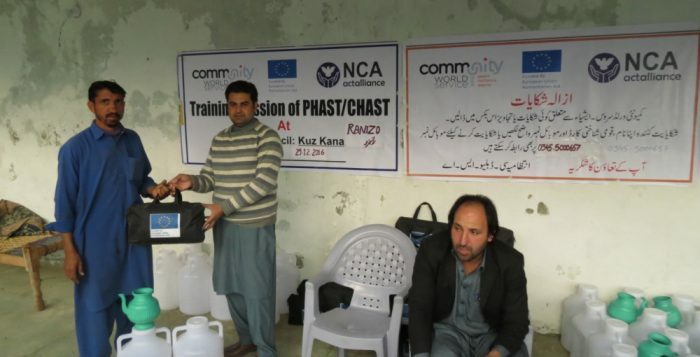 The project also provides trainings on Participatory Hygiene and Sanitation Transformation (PHAST) and Children Hygiene and Sanitation Training (CHAST) techniques of health and hygiene along with provision of hygiene kits and waste bins to the communities. The distribution of self-help repair shelter kits to the affected families has been completed. A total of 1400 shelter repair kits have been distributed among the targeted earthquake affected households. The shelter kits distribution was done in three of the selected union councils including Damori, Kuzkana and Shahpur. A standard process for the distribution based on the selection criteria of participants was followed under the project. Tokens were distributed amongst the concerned communities and information regarding the distribution ceremony was shared with all participants. It was mandatory for the community member to bring their original identity card along with the token to receive the assigned kit. On the day of distribution, an orientation sessions on safer construction techniques was conducted to enable the communities to utilize the shelter repair kit as per the guidelines. Follow-up visits are scheduled to be conducted in the coming months to guide the communities on how and where to construct their shelter and how to utilize the kit to avail its maximum benefits. Along with follow-up visits, follow-up sessions on safer construction techniques are also planned in the year ahead. Remote and rural areas affected by recurrent natural disasters often suffer the most when it comes to their recovery, rehabilitation and development. 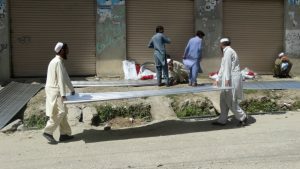 The 7.5 magnitude earthquake epicentered in the Hindu Kush range in winter of 2015 severely shook Pakistan’s mountainous northern belt, killing nearly three hundred people. In its aftermath, more than 14,000 houses were severely damaged or completely destroyed; community infrastructure was unusable and livelihoods were diminished. Almost a year later, the poor socio-economic life of the inhabitants remained largely unchanged. 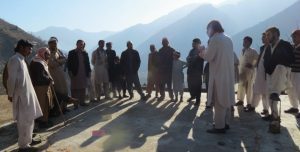 High altitude villages perched on the steep mountain slopes of district Shangla in northern Pakistan were severely damaged by the earthquake. 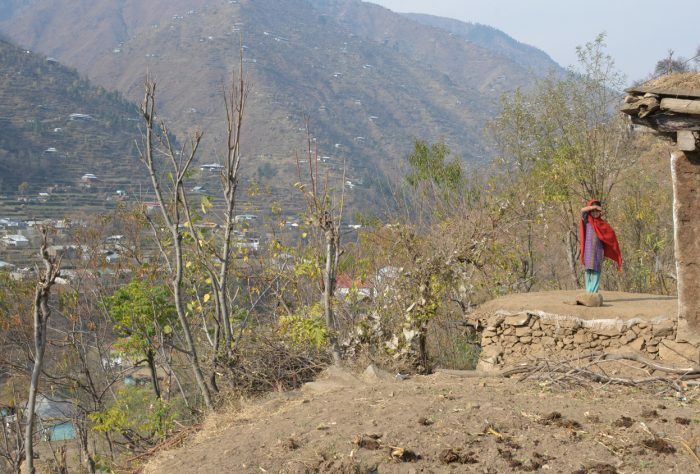 One of the hardest hit areas was Village Tanshit; mainly comprised of steep, rocky terrain dotted with 221 traditional, rural homestead compounds. Multiple families reside in each compound. After the earthquake, the community’s most basic infrastructure and facilities, which had been built with great effort and years of savings, were lost. The village’s sole water supply scheme became one of the earthquake’s most significant casualties. For the next nine months after the earthquake, the local women had to make a forty five minute climb on foot to a mountain stream and return with as much water as they could carry everyday. 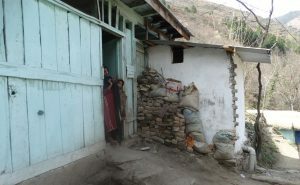 Families living in mountain village compounds have strong traditional, social and cultural codes for the protection of women, even for those undertaking daily domestic responsibilities. This usually means that the women stay very close to their homes. 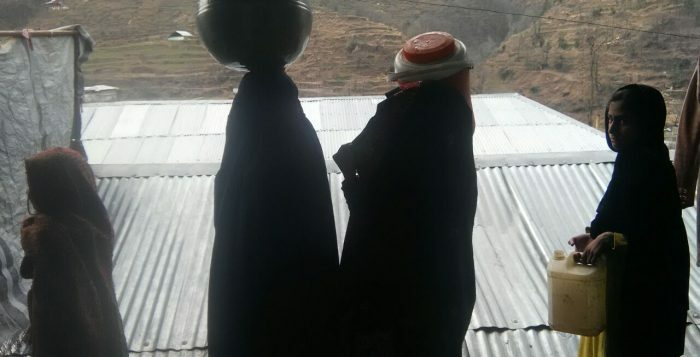 However, to access water, the women of Tanshit had to travel a long distance carrying water on their heads through wild and rocky mountain treks. As the water carried by a single person was insufficient for the entire family’s needs, sometimes the children were tasked with carrying water from the streams on their way back from school. This was dangerous and had to be done in daylight. In warmer months, these communities became very vulnerable to waterborne diseases as hygiene could not be maintained while carrying and storing this stream water. The human right to water and to sanitation constitutes the right of every individual, without discrimination, to sufficient, safe, acceptable, accessible and affordable water and sanitation for personal use. To ensure this right, in 2016 Community World Service Asia, in partnership with Norwegian Church Aid and ECHO, assessed the village Tanshit’s water system and was selected as one of the twenty communities under its’ integrated WASH, Shelter and Cash-for-Work programme. Technical assistance, construction materials and paid labor opportunities were provided to help villagers to restore their water system, reconstruct latrines and bathing facilities, and repair their homes. A village WASH Committees was formed to articulate the basic communal needs according to the project’s objectives and scope. The project team arranged hygiene sessions with the village women’s group and sensitized them on hygienic practices through Child Hygiene and Sanitation Training (CHAST) and Participatory Hygiene and Sanitation Transformation (PHAST) approaches. A pre-KAP (Knowledge, Attitudes, Practices) survey was also conducted to gauge the pre-existing or baseline hygienic practices of the families and to help demonstrate subsequent gains. To ensure ownership, each village’s drinking water supply scheme was selected on the recommendation of village committees. After a technical feasibility assessment conducted by members of Community World Service Asia’s engineering team, Tanshit’s water supply scheme was rehabilitated, with additional resources, successfully. The water source was reconstructed, protected and pipelines were installed throughout the village. The community contributed additional labor and materials as well to this reconstruction. Today, Tanshit’s drinking water supply scheme supplies clean, safe and ample water to 221 households as per Sphere standards. The risk of waterborne diseases has been decreased. The social protection of women has been ensured and their cultural sensitivities are preserved. Around 1,200 individuals are undertaking more hygienic practices that will significantly contribute to maintaining healthier families. The project team also mobilized the local community towards the maintenance and upkeep of their water system through a local community savings plan. They have also begun a small, intra-village savings and lending activity to commonly support their lowest income groups. This will enable every community member to maintain their compound’s connections to the scheme. An 8 year old Kainat was spotted during our visit to DHQ Alpuri. 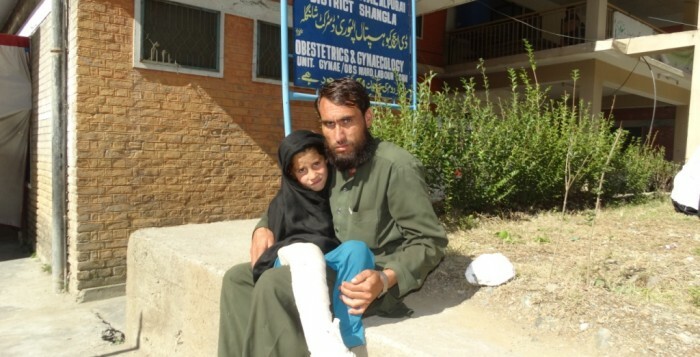 She was injured when we met her as she was held by her father, who supports a family of nine including his wife, his father, two sons and four daughters. 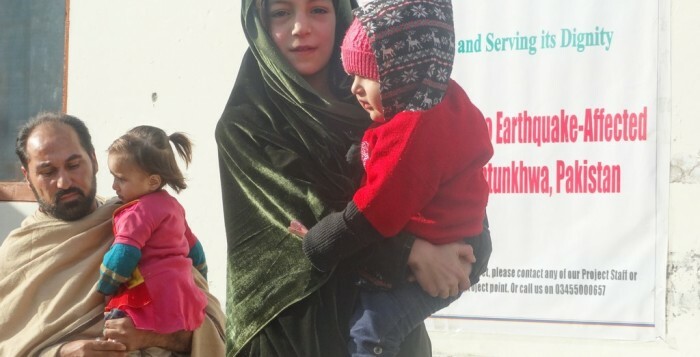 Kainat’s family are residents of the earthquake affected village Maal of UC Kuzkana, District Shangla. narrated Kainat’s as she recalled her experience during the devastating earthquake. Upon inquiring about the current needs of those affected by the earthquake, he replied that the affected communities are currently seeking shelter under polythene sheets in open fields as the other villagers help in providing them with food and comfort to the best of their abilities. The weather is becoming extremely cold. 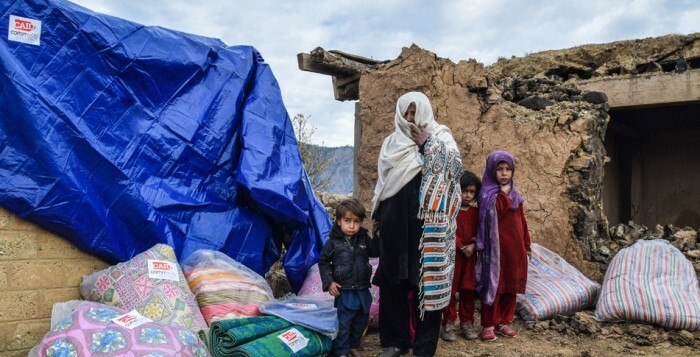 Tents, blankets and food items are most needed for families like Kainat’s to survive and recover.